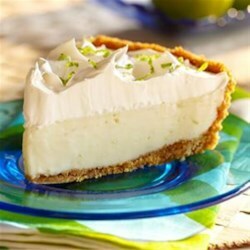 "Creamy, sweet, and tart, this classic lime dessert is always a favorite." Heat oven to 325 degrees F. Combine graham cracker crumbs and sugar. Add melted butter and stir until evenly moistened. Press mixture into bottom and sides of a 9-inch pie plate to form crust. Bake 10 minutes or until crust begins to brown. Cool 15 minutes on wire rack. Once you put the custard in the pie shell you better cook for 30 minutes. Will not be set in 10 minutes. Been making this for 42 years. We don't like things overly sweet so we added 2 Tablespoons of lime zest instead of just 2 tsp. Also added lime zest to the whipped cream, then put more on top. Delicious.